Think your kids are good at multiplication? 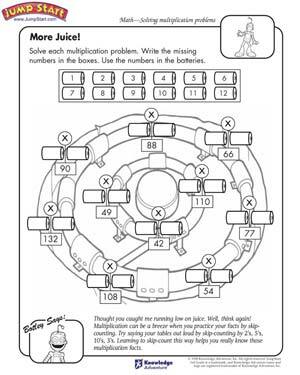 Give them our ‘More Juice’ multiplication worksheet and find out how good they really are! This worksheet has a bunch of multiplication problems with the answers already given. Kids need to use the options provided to fill in the missing numbers that form the problem. Sounds like fun, doesn’t it? Get started immediately!